If any of the above quotes sound like something you may have uttered in response to the Chiefs embarrassing 26-10 loss in the home opener to the Titans, stop kidding yourself. Seriously, stop it right now. This was supposed to be the “gimme” in the Chiefs 1st 5 weeks in the schedule that features a brutal stretch going to Denver, then Miami, back home for New England, then off again to San Francisco before being granted some mercy with a bye week. Now that the Chiefs home opener blew up in their face, I’m here to tell you they could easily be 0-5 heading into their bye week 6. Could they beat Miami on the road or maybe surprise the Patriots at home on a Monday night? Sure. But there wasn’t a single thing that I saw on Sunday against the Titans that would give me any logical reason to think so. OFFENSE: Alex Smith – 54% completion, 5.8 YPS, 3 INT; 1 actual WR who even made his presence known (Donnie Avery); 7 total carries for Jamaal Charles (2.7 YPC); A junior varsity offensive line that gave up 5 QB hits, 4 Sacks, and produced exactly ZERO running lanes for anyone not running for their lives (ie. Alex Smith). 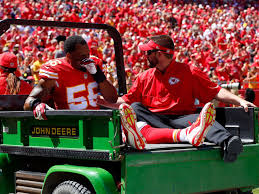 DEFENSE: Just lost their heart & soul MLB All-World Derrick Johnson, not to mention a pretty stout run-stopping DE in Mike DeVito; Eric Berry’s 1 tackles, not a single one of them near the line of scrimmage, nor whose presence was ever felt in the passing defense; 162 rushing yds allowed. Making Jake Locker look like a legitimate NFL quarterback. SPECIAL TEAMS: A failed fake punt; A missed FG by a rookie (and another one that also literally squeaked in); Zero danger in the return game; Allowing the kicker you just cut to save money outscore your entire team. Does that pretty much sum it up for you? I am concerned that there is no easy fix to this team. The problems stem from the exact things that I have been preaching all off-season: lack of solid starters and depth on the O-line, zero weapons at the WR position, and a woefully thin and undermanned secondary. Bowe returning will not solve the WR deficiency. While DAT adds a level of danger to the O when he returns, putting that responsibility of making dynamic plays every time he touches the ball is asking a bit much from a 5′ 8″ rookie. Those who said there were some bright spots were also incorrect. There was one bright spot: Travis Kelce. He should have played more than the 18 snaps he was on the field for (compared to 57 for Fasano). He adds a dimension to the offense they have not had since Tony G ran the halls. Someone needs to send a message to Andy Reid that the best playmaker in the NFL needs the ball more than 7 times, and their young playmaker Kelce should be on the field all game. Instead, we’ll think about our awful offensive line, new $45M QB who still cannot make a throw downfield, and the secondary that couldn’t stop Nate Washington, Kendall Wright, and Delanie Walker. This is bad, ladies and gentlemen. This is really bad as a Chiefs fan.